Bittersweet Enchantment: Blog Tour: The Burnouts (Quarantine #3) by Lex Thomas | Guest Post + Signed Book Giveaway! 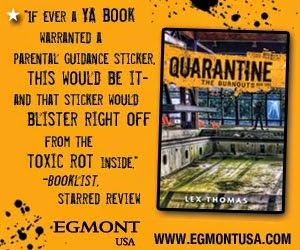 Blog Tour: The Burnouts (Quarantine #3) by Lex Thomas | Guest Post + Signed Book Giveaway! Lord of the Flies in a 21st-century high school setting.Welcome to Quarantine 3: The Burnouts, where readers of The Maze Runner, Gone, and Divergent go when they're hungry for more dark, compelling survival stories. A question we are often asked is how do we write novels as a duo. Writing a novel is usually a solitary act, so I understand why the idea of two people writing a novel together is intriguing. Every writing team has their own approach, but here’s how Lex and I have done it so far. We’ll talk about the story, either in person or on the phone, for hours on end, trying to figure out the turns of the story and what it’s about. This is probably the most fun part, and that’s why it’s easy to get stuck here, because at this stage you haven’t made any firm decisions so everything seems possible. Once you make decisions about the setting, the tone, the characters, the premise, then your range of options narrows and it becomes more about making the right decision for the emerging story. We're sketching out a structure for the story as a way to vet it, and try to understand what it is. We keep trying to develop it until we understand what each act is about and we have an idea of a the big scenes and turning points, or until we run out of time and have to start typing. We had the most detailed outline with our first book, and a much more sparse one for books 2 and 3. We also come up with a bunch of fun ideas during this stage that we don’t know how they relate to the story, and some of them end up working their way in later. In general, I’ll write the first draft of a chapter and send it to Lex, and he’ll revise it and expand it, while I’m working on the next. We keep doing that all the way through to the end, talking on the phone once or twice a week to talk over story stuff. Sometimes we stick to the structure we came up with before we started, but it often changes because you don’t really know if it will work until you actually try to write it. Also what we come up with is only a bare bones breakdown of the big turns. Most days I’m writing a chapter off of notes I’d written the night before, or I’m starting from scratch, knowing that I’m working toward the next big story beat, which may be many chapters away. I usually would have some idea of what the following two or three chapters would be about, but sometimes I’d have none. It would all come down to how much brainstorming I’d had time to do at the end of the day, and what we’ve come up with on the phone. Once I finish the last chapter and send it to Lex, a few days later he’ll send me back the full revised manuscript and we both read the book for the first time. Now, a little backstory. The first time we did this process was on The Loners, and neither of us had ever attempted to write a novel before. When we sold our proposal for the trilogy, we were told we had two months to deliver a first draft, and I was terrified. Writing a novel seemed like an impossible feat, like someone asking me to design a cathedral. By the time we got to the end I was a nervous wreck and had barely left my apartment for the two months, obsessing over every choice in every chapter. So when Lex sent me his revision for the Loners and I read it, I was in total shock. He’d changed everything. Now I don’t know what I was expecting, how can you revise something without changing it? And he hadn't actually changed everything, but that’s how it felt inside. I had stressed endlessly over every choice I'd made, and had reasons for everything, so it was difficult for me to read the changed version. It wasn’t that his changes were wrong, it was that I knew my version so well that it was hard to not have a running dialog in my head of what I knew should be there and why. It felt like I had just killed myself to write this thing and my draft had disappeared the moment after I finished it. Now this was a totally emotional reaction, I was too involved at the time, and everything ended up working out for the best. But that’s what writing as a duo is. It’s a collaboration, and you are going to change each other’s work. You’re also going to have to find a way to agree when you disagree. On all three of our books we tended to reach the point where we’re reading the revised manuscript about 10 days before our deadline. So those last ten days are a doozy. After reading it we decide on what all the problems are and what solutions we can do in time. We're trying to find the right way to blend our two drafts into one draft that takes the best from each. We always have new scenes or new chapters that need to be written, tons of logic that needs to be straightened out, character arcs that need to be adjusted, etc. We divy up doing all that work and all the new content that needs to be created between the two of us and it becomes a mad dash to pull this Frankenstein monster of a draft into shape for our editor to see. We're also doing a top to bottom general revision of every chapter if we have time. By the time we finish we always end up with a draft we both like, which still needs work, but it’s one that we are both proud of, and the points where we still disagree are minor and few and far between. It’s a boatload of stress in the end of the process the way we do it, but it always seems to work out. A lot of other writing duos trade off who starts which chapter and then they’ll email it back and forth, revising each other over and over until neither of them want to change anything. That seems like it would take forever to me, but others swear by it. Regardless of your approach, writing a novel with a parter is about eventually getting to the point where it is one vision, one take on a story, and one voice to the writing, despite the fact that two people wrote it. If you’d like to try it yourself, I’d say pick a writing partner who has similar taste, and one that you get along well with, because it’s going to be stressful and there will be mountains of things that you’ll have to agree with them on. Writing a novel is a long process, and when you have a good partner it can make it easier. Your partner will often see solutions that you can’t see and come up with ideas you never would have thought of. It can also be more fun to get excited about a story with a co-conspirator than alone. And most importantly, when the writing gets tough, it’s nice to have someone to share the misery with or to talk you down off the ledge when you feel sure that the entire thing should be thrown in the trash. Lex Thomas is the pen name used by the screenwriting team of Lex Hrabe and Thomas Voorhies. Lex Hrabe was a Drama Geek in high school as well as student body president. Lex received a BA in Drama and English from the University of Virginia and has worn hats as an actor, director, and writer. In addition to working as a screenwriter, he heads development at Cinespire Entertainment, a boutique production company. If Thomas Voorhies were a character in the Quarantine trilogy, he would be a member of the Art Geek gang. Thomas graduated with a BFA from the Rhode Island School of Design and continues to practice and exhibit his realist oil paintings. To see a selection of his artwork, visit www.thomasvoorhies.com. Lex Hrabe lives in Virginia; Tom Voorhies lives in California. The wonderful people at EgmontUSA is giving me a SIGNED print copy of The Burnouts! To enter use the rafflecopter form below. I think I'd probably end up joining the Loners! Probably the Loners...that was who I was a part of in high school. We had our own little group, and weren't really a part of the popular crowd, but I liked it that way.